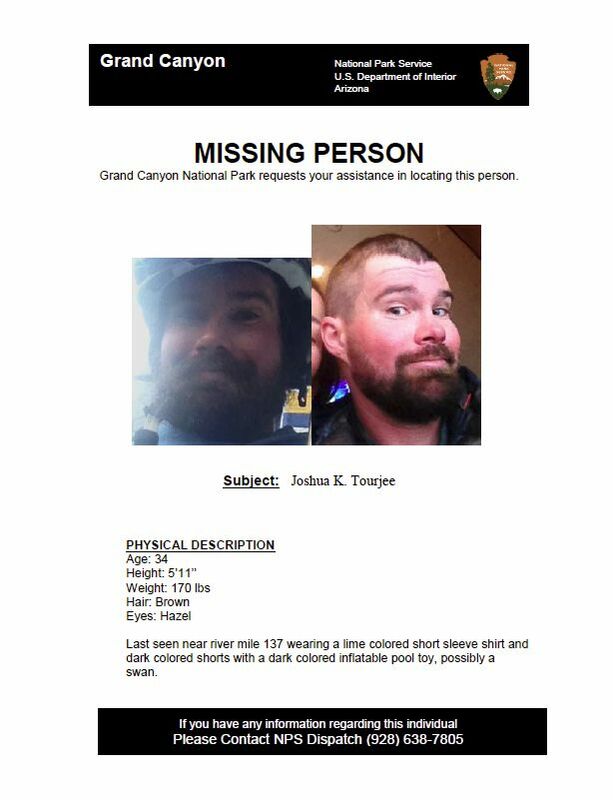 GRAND CANYON, Ariz. — A National Park Service Search and Rescue crew was flown into the Grand Canyon early Tuesday morning to begin the search for missing river guide Joshua Tourjee. Tourjee was reported missing on Monday by his river trip after failing to return to camp the previous evening. Due to high winds the National Park Service was unable to transport searchers into the canyon Monday. Using an inflatable Zodiac search and rescue boat, crews searched on the water from the point last seen, River Mile 137 (Pancho’s Kitchen) to River Mile 148 (Matkat). On Wednesday, two ground crews are slated to search the areas from River Mile 139 (Fishtail) up to Pancho’s Kitchen and from River Mile 143 (Kanab Creek) to Fishtail. An additional boat is launching from Lees Ferry to aid in the search efforts, and the Zodiac will continue to search high-probability areas. Tourjee is described as a 34-year-old male, 5’11”, 170 lbs, brown hair and hazel eyes. Tourjee was last seen wearing a lime colored short sleeve shirt and dark colored shorts with an inflatable pool raft. Tourjee is working as a guide for OARS. On Tuesday, a commercial river trip reported finding an inflatable pool toy approximately 19 miles downstream from Tourjee’s last known location. The National Park Service is currently conducting a search and rescue operation. A missing persons investigation is ongoing. No further information is available at this time. Any individual with information on the location of Joshua Tourjee should contact National Park Service Dispatch at 928-638-7805.